Like faculty at most research institutions today, Baylor researchers in the STEM fields—science, technology, engineering and mathematics—long ago learned that joining forces with colleagues both inside and outside the institution results in a sum of accomplishments that is much greater than its parts. That’s especially true of early- to mid-career investigators whose formative years in training were spent in the interdisciplinary environments that so often characterize research institutions. Some bring with them to Baylor longstanding partnerships, while others find opportunities to develop partnerships with new colleagues with whom they share common research interests. A good example of the latter is assistant professor of mathematics in Baylor’s College of Arts & Sciences, Dr. Constanze Liaw, the latest addition to the roll of research fellows in CASPER—Baylor’s Center for Astrophysics, Space Physics and Engineering Research. Liaw came to Baylor in 2012 after a three-year stint as a visiting assistant professor of mathematics at Texas A&M. A native of Germany, she holds an undergraduate degree from the University of Stuttgart and graduate degrees—including a Ph.D.—from Brown University in Rhode Island. She is a “pure” mathematician by training and preference, but a recent chance conversation between her husband, Baylor assistant professor of mechanical engineering, Joe Kuehl, and CASPER director Truell Hyde, drew her into the realm of applied mathematics. She began attending weekly CASPER research reviews and started meeting with CASPER associate director and assistant professor of physics, Lorin Matthews. As the two became more familiar with each other’s work, a system began to take form that spanned the three main branches of physics research: numerical, analytical and experimental. 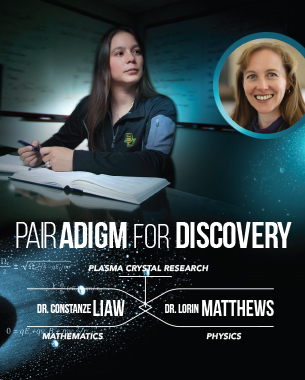 Matthews applies numerical models that simulate the behavior of dusty plasma crystals to data from previous experiments. She then hands off the results to Liaw, who performs a detailed mathematical analysis to determine what those results actually reveal. The two then work together to guide CASPER’s physicists in conducting new experiments that will further refine our understanding of plasmas, the most common form of matter in the universe. Part of their work relates to Anderson localization, a phenomenon named for American physicist and Nobel laureate P. W. Anderson, which relates to the “localization” of electrons in a crystal. It is a process important to the materials and electronics industries where a thorough understanding of the behavior of electrons in crystalline materials, such as graphene, is key. Though Liaw would be the first to agree that mathematicians tend to be a reclusive lot, they do enjoy getting together to learn from each other. This past summer, she and three colleagues organized a small gathering of top international mathematicians at the prestigious Mittag-Leffler Institute in Stockholm, Sweden. Liaw also applied for and was awarded a National Science Foundation grant that allowed several rising young American mathematicians to “meet in this very private setting with the superstars in the field,” she says. As you might imagine, gatherings of mathematicians are considerably more sedate than the typical conference. Liaw admits that, as much as she loves the often solitary nature of mathematics work, she most enjoys working with students one-on-one or in small groups. It is a love that began in the eighth grade when she was asked to tutor a younger student. She continued tutoring all the way through completion of her Ph.D.